Below The Turret Ring: New T-64 version with unmanned turret in the making? New T-64 version with unmanned turret in the making? 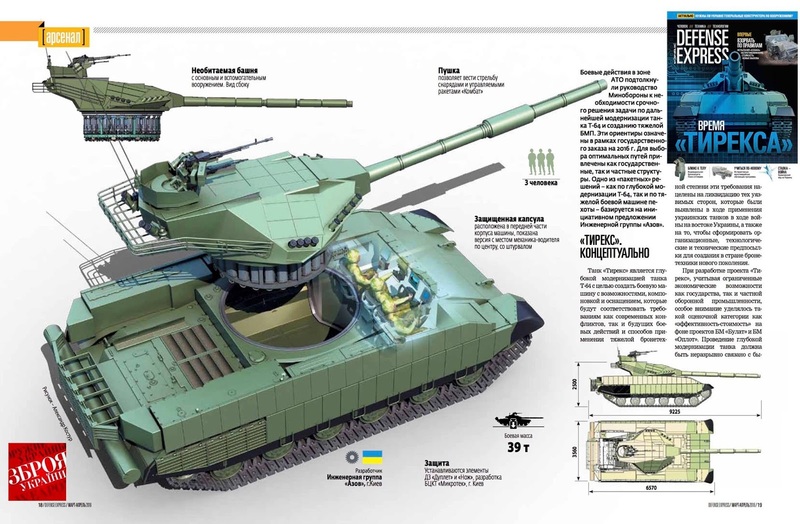 According to Ukrainian newspaper "Defense Express", a new version of the T-64 MBT is being developed. The new version of the T-64 will supposedly be more advanced and better than the current T-64BM Bulat main battle tank (MBT) operated by the Ukrainian Army. 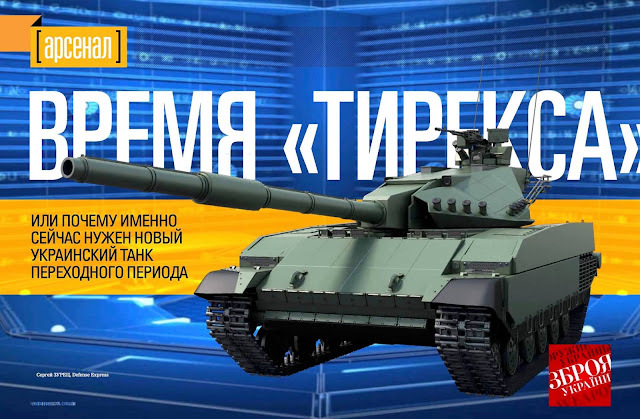 Like the T-14 Armata the new T-64 version will utilize an unmanned turret. The crew of three (commander, driver and gunner) will be moved into the hull, an armored bulkhead behind the crew compartment separates the crew from the highly explosive ammunition stored in the standard T-64-style autoloader. It has been claimed that the Azov volunteer brigade is responsible for the development of the new T-64 version. The Azov unit already developed the Azovets urban combat vehicle based on the T-64 chassis. The new T-64 version will feature a remote weapon station (RWS) with a 12.7 mm heavy machine gun (HMG) located on top of the turret bustle. Like on the T-90MS, the commander's independent periscope also functions as main optronics for the RWS. The turret features four banks of smoke grenade launchers, each holding 4 smoke or multi-purpose grenades. Apparently the RWS can also be fitted with up to four smoke grenade launchers. The tank is protected by composite armor and additional Duplet heavy ERA. The ERA is also fitted to parts of the turret, something that hasn't been done on the T-14. Unlike the T-14 however the upgraded T-64 is not fitted with an active protection system (APS). As main armament the tank will feature a 125 mm smoothbore gun, probably the localy built KBA3 or KBM1M tank gun. At a weight of 39 metric tons the upgraded T-64 will be a lot lighter than the T-14, however the overall physical size of the tank seems to be quite a bit smaller. However it seems that the hull height had to be raised in order to make enough room for enough space for the seats, controls and equipment for the crew of three. There are also only two sets of containing three vision blocks each, thus either the commander or gunner can only utilize the optics fitted to the turret. The T-14 Armata's design includes a seventh vision block at the hull. PS: As the cover of Defense Express reveals, despite the new turret the vehicle will keep an IR illuminator like the original T-64.